Congratulations Tyler Thompson for completing graduate School in NYC and on your upcoming marriage to the lovely Tessa. Now that I got that out of the way let’s talk ink. More specifically, Organics Studio Ink. When Tyler was a student of the University of Maryland in early 2010 he would stop by the store. When his busy schedule allowed, he would peruse Bertram’s Inkwell. “Cool guy!” we thought to ourselves. He’s knowledgeable, loves pens, knows pens, and even has pens! Who is this kid? As time went on and friendships developed, Tyler worked for Bertram’s Inkwell part-time. He should have been full time since most of his pay checks were not deposited into his accounts but cashed in the drawer ever other Friday as he picked up his latest pen/pens from the store. So it goes for many folks who have a love of pens and end up working in their favorite shop. Not only was Tyler interested in fountain pens but also in what went in them. And so in 2012 Organics Studio was launched. Originally there was the Chemistry Series, with the take on a collection of the essential colors of any writing ink collection. These inks makeup a set of ‘simple’ colors, tasked with coloring the basic spectrum of pure colors. These chemistry-themed inks were the first foray into the ink world, and are still part of the formula. The first four colors ever made included Carbon Black, Mercury Red, Cobalt Blue, and Manganese Blue/Black. Then expanded to include Uranium Green, Vanadium Violet, Arsenic Gray, Copper Turquoise, Sulfur Yellow, Nitrogen Vibrant Blue, and Lithium Violet. In 2016 the resurgence of the company will include a selection of these previously available inks, along with some new members. 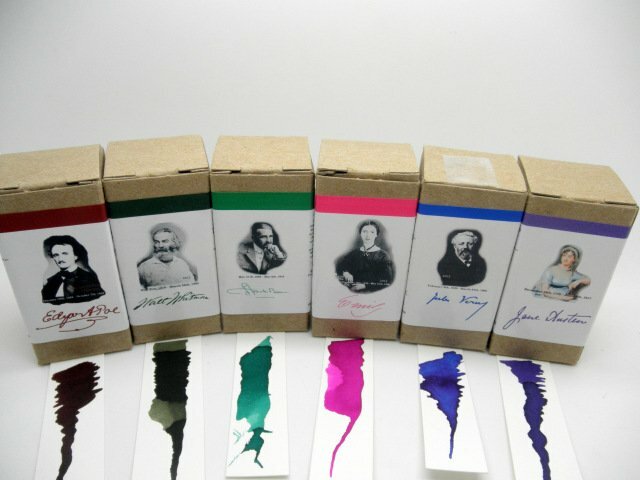 Organics Studio ink collection attempt to merge a famous writer from previous centuries with a color that brings them to mind. These inks have more unique hues that we made to fill gaps in the available ink world. This series pays homage with inks such as Jane Austen Violet, Jules Verne Nautilus Blue, Edgar Allan Poe Raven Red, L. Frank Baum Emerald Green, and many others. In this line also included is the renown Sepia Series, which included Foggy Bottom Red Sepia and Join or Die Green Sepia, two inks made to commemorate the DC and Philadelphia Pen show, respectively. And the next is true to Tyler’s heart. These inks are all forays into unique ink properties. 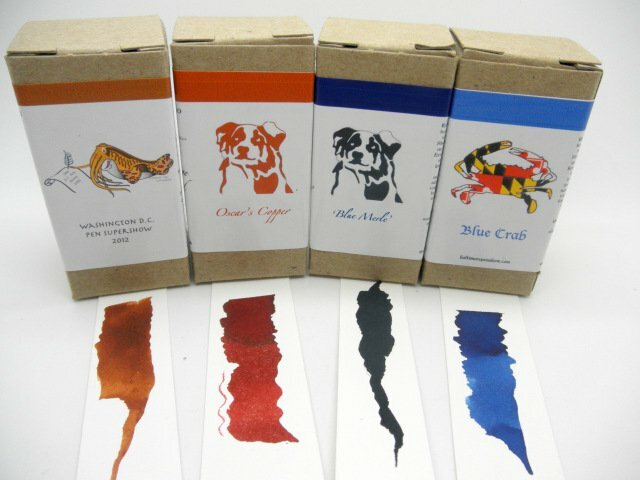 The Darwin Ink Series are all fast-drying inks. The Accident Blue, the Isaac Newton black, and the Gregor Mendel are pigmented and Chlorophyll-based ink. The Organics Studio inks do well with being left in the pen for extended periods of time. This way you don’t have to worry about damaging such pens. These inks have become some of our customers favorite inks for their unique colors and desired properties.